In lead up to World Environment Day i thought a challenge was in order. Inspired by the deliciously funny post by Katrina at Kale for Sale I thought that it's the kind of post i really love reading; amusing commentary on someones life challenge to step outside the comfort zone and do something a little unusual in the name of saving just a little bit of plastic stuff from its disposable lifecycle. Katrina writes about her self consciousness and inner musings as she walks the footpath with her big red plastic bowl to transport home her takeaway chicken. 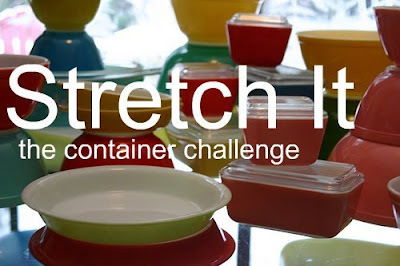 The idea behind Stretch It is that by sharing ideas and experiences about how to generate some small changes, push the social boundaries, redefine the norms of acceptability which surround dispoable... we reduce our fear by encouraging interesting and amusing alternatives to food and goods transport, from supplier to home. This way we can share the humiliation and exhiliaration around and have a good laugh along the way. I find that knowing someone else is doing something, that i share the pain makes a challenging behaviour more palatable and I learn from the ingenious ideas that others have that i never thought of. Not put off by the fact that its generally big gun bloggers who start challengers either, I thought why the hell not? we all have to start somewhere and i thought it was a great way to showcase everyones small actions and attempts and foibles at reducing superflous plastic consumption. Write a post on what you do thats a stretch to your comfort zone, ouside the norm or about something thats been bothering you and some alternatives you've been pondering which you might challenge yourself to do...take a tub to the cheese shop and buy off the wheel, use the wheelbarrow instead of the car, take your ceramic cup to the upmarket coffee shop, whatever and link back here! Love it! I tend to just not buy something if the packaging offends me... which means I often go without. Now I can push my comfort zone and have a giggle about it afterwards. Yes, its the good times of the aftermath Im after! I can't tell you how many times since I posted about the red bowl that I now think of you and the wheel barrow from your comment. I'm still laughing. And am still inspired. It helps to write the craziness I feel in the middle of taking simple changes and reading other peoples stories definitely encourages me. Who knows where I'll Stretch It next. But I'll let you know. I've been reading and re-reading this trying to think about something that I can write a post about, still having trouble, but will mull over it a while. pip- love to hear what you do come up with! im working on my next container challenge. My stretch outside my comfort zone is to provide cloth napkins for guests. Weird I know. I'm a whimp! I have no idea why - but I am a closet cloth napkin user. I have a secret stash of paper napkins that I bring out for guests. But next time I have guests i WILL put out the cloth napkins. thanks Kel - great challenge. christie- hi, welcome. Its not small! All these things add up, change ou consciousness. Not just yours, the cofee makers too, pople watching. Everywhere we say 'no thanks' is just that bit more. Its revoloutionary in its own small way.